On Tuesday 18th June Allumer attended a fundraising evening for ‘Diversity In Care’ at the Opera Gallery, London, to raise money for vulnerable women and their children in the UK. The event was hosted by trustee Lisa Moorish and featured an art auction and a luxury raffle fundraiser. The charity fundraiser had fantastic donations from artists such as: surrealist Nancy Fouts, Zoe Grace, Natasha Law, Giles Curties, Oliver Clegg and a print by Rankin. The exclusive raffle with incredible prizes including designer clothes, art, spas days, nights in hotels and jewellery. Allumer particularly loved the David Bowie inspired piece by artist Joe Black, shown above. The image was created using painted test tubes on aluminum. We thought the piece of art referenced our colourful ALLUMETTE BELLS. 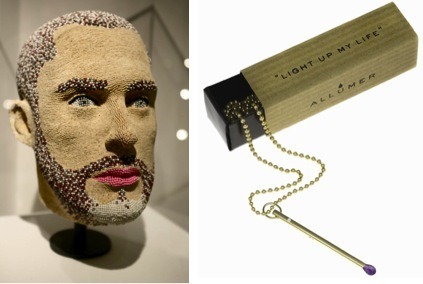 Another memorable piece from the charity gala included this sculpture created my David Mach using matchsticks, which reminded us of our own ALLUMER MATCH collection. Guests at the event included comedian Russell Brand, Noel Gallagher et al.